Mathematics is often perceived as a culture-free, objective discipline. There is considerable evidence, however, that mathematics is inextricably linked to local culture. The history of mathematics reflects the development of social culture, and branches of mathematics have developed, and continue to develop, to solve problems in a particular context. Mathematics as taught in schools is affected by the language, ethos and needs of the society. Curriculum development is not context free, and the choice of what mathematics to include, or at which point in schooling particular mathematics topics should be addressed is as much a political as an educational decision. 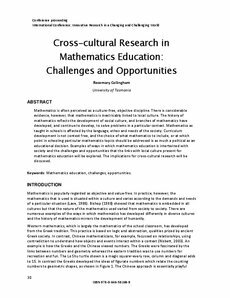 Examples of ways in which mathematics education is intertwined with society and the challenges and opportunities that the links with local culture present for mathematics education will be explored. The implications for cross-cultural research will be discussed.